Here are a series of articles, research and speculation on the Legend of the Green Man. You have the opportunity to comment using the reply box at the bottom of this page….. The Green Man is found in many forms throughout history. covered by foliage, very often sprouting from their mouths. He is often found carved in wood or stone in medieval churches and cathedrals. the masons has perhaps been lost in the mists of time. Christianity and the Pagan beliefs it replaced. Christian churches at the site of pagan sacred places. when Lady Raglan published an article in the “Folklore” journal. and the start of the cycle of growth. I am sure that the Green Man means different things to different people in this day and age. To many he represents a figure who is an Environmental guardian “the keeper of the forests and woods”. “Jack in the Green” by Dragonsfly from the CD “The Ridgeway”. Jack in the Green – Jethro Tull. Etymologically Robin comes from the Norman ‘Robert,’ a form of the Germanic Hrodebert and it originally meant ‘famous’ or ‘bright’ or even and more pertinently ‘to shine.’ This is and has always been an indication of one who has achieved illumination or enlightenment. Robin Hood is therefore the ‘Bright Hood,’ a similar name to the Naga serpent worshippers or deities of India, with their illuminated serpent or cobra hoods. As many have previously stated there are strong links between the origins of Robin Hood and the Green Man, who is also the ancient Egyptian god Osiris and the Greek-Roman god Dionysus/Bacchus, and so we should hope to find something of interest in the many stories surrounding this enigmatic character. There are elements of the Robin Hood myth that relate to other legends. The ‘tree of life’ is seen as ‘Robin’s Larder Tree,’ supplying all that could be required like the ‘Horn of Plenty’ or the ‘cauldron’ of Celtic folklore. Robin’s link with the ‘Horned God’ is also telling as he is Lord and Master over the human ‘animals’ of the Forest and they are guardians of their stolen treasure, like the hoarding, serpent Nagas of Hinduism. They do good deeds for those who deserve them and dastardly deeds to those who do not. We must also remember that Moses was taught in Egypt, the home of the Green Man Osiris, and that Moses was the one who raised the Brazen Serpent in the wilderness to heal the people of Israel. In the connected tales of Robin Goodfellow, the ‘trickster of the woods’ also known as Puck, there is also the link of Sib, the fairy who lives in the hillside and is linked as being a ’serpent spirit’ of healing. Robin falls in love with his lady of the waters or Queen of Heaven (a title also given to Isis the sister/wife of Osiris and also a title given to Guinevere) later to be known as the Maid Marion (Marion/Mary coming from Mer = Sea/water/wisdom) and in many ways is undermining the new Christian world that forced itself upon this ancient mixture of paganism. He is also green like the ‘Green Man,’ which is the special healing color attributed to many things surrounding the serpent cult — such as the Emerald Tablet, the color of initiation into Gnostic mysteries associated with the Masons, and the Green Glass of the Grail. What we also find however in some of the earlier tales is that Robin Hood and Little John – like Jesus and John the Baptist – were equals. Walter Bower, in the 15th century, said that Robin Hood together with Little John and their companies rose to prominence. This in itself points out that both Robin and John were seen to each have their own followers very much like Jesus and John. They are therefore and must be the ‘twins’ of Gnosticism, like Castor and Pollux – the duality and balance. Tammuz, Adonis and Osiris are vegetation gods of greenness. Indeed Osiris himself in the Pyramid Texts at Saqqara is called the ‘Great Green’ and often appears green skinned as a symbol of ‘resurrection and life.’ The battle between Osiris and Set seems all the more familiar now in the struggle that ensues between Robin and his archrival the Sheriff of Nottingham. Osiris becomes Horus when resurrected and we find that it is Horus who is protected by the Wadjet snake — the green snake. Even in the way he dies there are links with older mysteries. Robin is ritualistically bled to death like the ancient pagan sacrifices. The deed is done by the Abbess of Kirklees, who acts as the priestess in some ancient pagan ritual. Could it be that the tales of Robin are more ancient than previously believed? Could they really be tales of ancient Egypt and even Sumeria? Passed down over millennia and altered by time? Temuujin Chingis Khaan was born on 25 dec 1166. The mysterious yet omnipresent Green Man is already an icon. He links us with England’s pagan past and reminds us of our deep and sacred relationship with the natural history of these islands. He represent the spirit of the ancient forests, at once terrifying and protective, and the natural cycle of birth, death and rebirth. As old as time himself, he has become a familiar image to us all. Adopted by medieval stonemasons, this elemental pagan image peers at us from the roof bosses and columns of hundreds of our oldest churches and from the T-shirts of young festival goers, a witness to the changes of centuries, yet as unchanging as the very earth from which he springs. 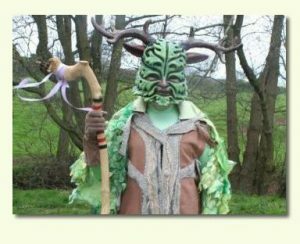 He is Jack-in-the-Green, Robin Hood, Herne The Hunter and the Celtic god Cernunnos. An icon for respect for our beautiful country and its past, but also perhaps a unifying champion for the coming environmental battle for its future. The Green Man has always been around us, he stared down at us, the face with the foliage pouring from the mouth in Churches and Cathedrals for centuries. The first recorded references to the Green Man go back to the second century, but his origins are lost way back in time. 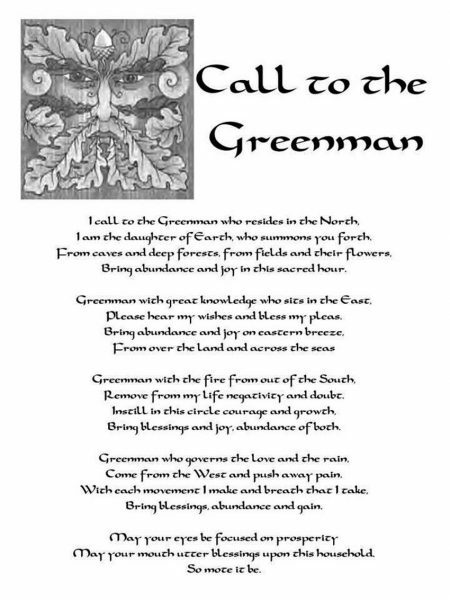 The Green Man is believed to symbolise the cycle of life, death and re-birth. The symbol of Godhood within the male and its relationship with the transcendent life force our Goddess, the female expression of divinity. He is a Pagan symbol who heralds Spring after a long winter and the renewal of lush vegetation. is no longer widely known, but he was a very importance being to our ancestors. If you walk within a forest of ancient woodland and get the feeling you’re not alone, the chances are he is with you. He’s been with mankind from the start and now is around us more than ever helping us to make contact with our natural environment and stop destroying our ever fragile world. Perhaps the importance of ancient treescapes in our history accounts for their depiction in the places of worship. dancers in seasonal celebrations. This is a man who is decked in leaves and branches from the Forest. He is indeed a figure to be honored. “Robin Hood was a species of fairy derived ultimately from the old Celtic and Saxon fertility god or vegetation deity, the so-called Green Man. While in popular folklore Robin Hood was interchangeable with Green Robin , Robin of the Greenwood, Robin Goodfellow, Shakespeare’s Puck in A Midsummer Night’s Dream, who, at at the summer solstice, presides over fertility, sexuality and nuptials. The Robin Hood legend provided, in effect, a handy guise whereby the fertility rites of ancient paganism were introduced back into the bosom of nominally Christian Britain. Every May Day, there would be a festival of unabashed pagan origin. Rituals would be enacted around the May Pole, traditional symbol of the archaic goddess of sexuality and fertility. On Midsummer’s Day, every village virgin would become, metaphorically, Queen of the May. Many of them would be ushered into the greenwood where they would undergo their sexual initiation at the hands of a youth playing the role of Robin Hood or Robin Greenfellow, while Friar Tuck, the Abbot of unreason, would officiate, blessing the mating couples in a parody of formal nuptials. By virtue of such role-playing, the borders separating dramatic masque and fertility ritual would effectively dissolve. (From the temple and the lodge, by Michail Baigent and Richard Leigh). Graves proposed in The White Goddess that two mythical figures, the Holly King and the Oak King, representing two halves of the year, perpetually strive for superiority, the Holly King triumphing over the Oak King at midwinter and the Oak King triumphing in turn at midsummer. even Jesus and John the Baptist. These pairs are seen as the dual aspects of the male Earth deity, one strong in the summer, the other strong in the winter. of the Year. He is also seen by some Neopagans as an early inspiration for the Santa Claus legend. How can we use the Green Man? value to your house and garden. *A perfect gift – This is a thoughtful gesture, which shows originality and consideration. Many of our Green Men are used as very successful gifts. *In the garden or home, you could also incorporate into an area of rest and reflection – a “Green Shrine”. This helps to acknowledges our connections with the natural world. The Green Man: Ash Mandrake & Friends. The Green Man: Type O Negative. Magpie Lane: Jack in the Green/Jacks Alive.